LANSING — Michigan State’s board of trustees will address a plan Friday to pay a $500 million settlement to Larry Nassar’s victims, a meeting that comes amid calls for the school’s interim president to resign over recent comments about some of the women and girls the former sports doctor sexually assaulted. 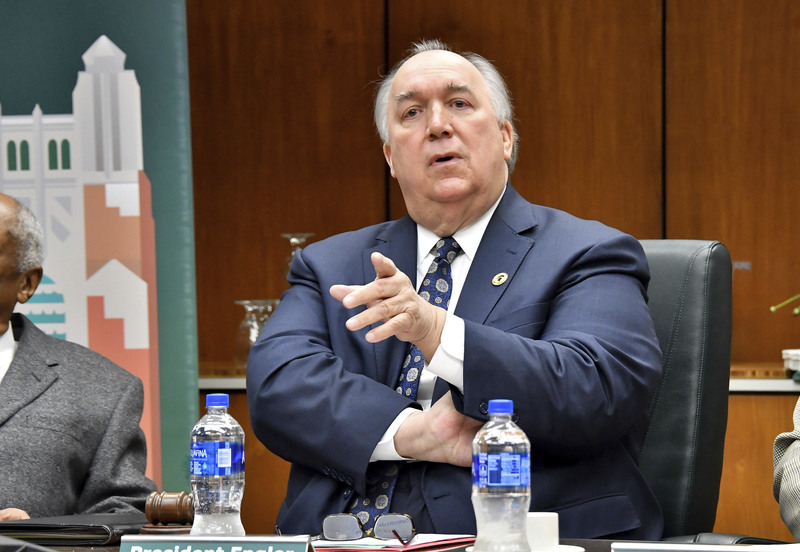 Although the board appears to lack the votes to oust John Engler from his interim perch, the public meeting likely will be heavily attended by people who are fed up with Engler and want him gone. The primary focus of the meeting is the school’s budget, along with the settlement plan. Some 150 of Nassar’s victims have joined a public crusade to force Engler out of the interim job. Last week, two university trustees also signaled they could call a vote during a board meeting Friday on whether to fire him. Engler apologized Thursday for his April email exchange suggesting gymnast Rachael Denhollander probably received a “kickback” from her plaintiff’s attorney. Denhollander said she appreciates Engler’s gesture but remains convinced he cannot lead the university forward. When asked in a Thursday interview with The Associated Press why his apology took a week, Engler said he was traveling out of state and “wasn’t as focused on it.” He said when he returned and realized the reaction, he wanted to make his position clear in an apology.